We receive literally hundreds of thank you letters, emails and telephone calls from customers we help every year with conservatory overheating and glare problems, frequently expressing their delight after installing Polycool Solar Control Inserts. Just installed Polycool inserts on a diy basis. Simple to fix as long as you keep the insertion tool at right angles to the channel. Brilliant service from the company, even at the weekend, with tips and advice, making the job even easier. Thank you very much. Now just waiting for the sun! Just had polycool fitted. Wow its amazing. Well worth the money. Its not to exspensive. Noticed the differance straight away. Would reccomend to anyone with a conservatory. I had Polycool installed on Friday in my south facing conservatory. Already I can notice a huge difference. Even with the sun on the roof the room stays significantly cooler. As my dogs spend their time in there, this is exactly what I was looking for! Many thanks Andy & co. This is the most fantastic product sold by an exceptional company. Every aspect of their company service is first rate; from the initial response to an enquiry, to the careful date selection for fitting and the fitting itself. I could not be more impressed with the skill and professionalism of Andy and Jake who fitted my conservatory with Polycool. They were so polite and neat and worked really hard without any moaning or questionable language. The instant difference polycool has made to the glare and heat in my conservatory is nothing short of amazing. I was going to say that Polycool is Perfect but no one is perfect and, after careful consideration, I have found a fault with Andy and Polycool. Andy undercharges so badly that I was embarrassed to pay his bill. The prices are ridiculously low for a fabulously high quality product and service. I cannot recommend this company highly enough. Thank you so much. Had our roof done on 30th June. The following day, the room reached 35 degrees, same as the outside temperature, with the doors and windows closed! Amazed at the difference already and we are able to use the room all day, instead of a few hours in the morning and evening. The guys were lovely, polite and knowledgeable and finished the job in one day and we would highly recommend getting them to do the installation. We are really pleased and would recommend this company to anyone. We have just installed the Polycool solar inserts and already our conservatory has become more usable. The glare has gone and the heat much more bearable, a definite difference from the outside temperature. We are south facing so before the inserts, when the sun was shining, the glare and heat made the conservatory uncomfortable. We are now using the room as our main room. The inserts were easy to fit, quick installation, highly recommended. Service from Andy and Kerry brilliant, thank you. A short note to say how delighted we are with the results having fitted your product at the weekend. The entire process, from our initial enquiry to the finished product being in place has been excellent. We were well advised on the telephone by Fay, who was courteous and informative. Our questions were answered patiently and politely. The transaction was straight forward and delivery was on time. Fitting was quick and easy and the end result is remarkable. Our conservatory was unbearable on a warm day, but is now a pleasant room to sit in and enjoy. Thanks to all at Polycool. We will gladly recommend your service. I am really please with your product, it's fantastic and at last we can use the conservatory as it should be used. I was quoted over £5,000 three years ago and was told that I needed a new roof. Your product and fitter are excellent. I purchased the gold inserts a few months back....with the weather just Improving .. we have have been able to enjoy our conservatory and we have been able to use the conservatory mid day in sun when previously we could not. We cannot wait to see what difference the inserts make this autumn. Our other problem of glare through the roof when sunny has been eliminated. Both my wife and I are in our late sixties and over the years we have purchased many items following persuasive promotional promises . Our purchase from Polycool was the latest. The service from Polycool was impeccable, the product of very high quality and, best of all, it works just as promised. We are both convinced that Polycool fulfilled their promises more successfully than any other Company we can remember. Thank you so much. we fitted it last weekend, just before 'summer' arrived, and we have to say how pleased we have been with the product, we were concerned if it would affect the amount of light we have in the conservatory, but we are pleased to report that their has been minimum effect in the amount of light we have, but what we do have now is a room that we can use functionally as a dining room thank you, we would certainly recommend your product . Have just finished installing the gold inserts into our south facing conservatory, and would like to say how pleased we are with the result. They have certainly made our conservatory a much nicer place to sit and enjoy in the summer. Would definitely recommend them to anyone who has a hot conservatory. What a wonderful product. Despite the coldest winter in memory, the conservatory was still usable with only minimal heating - to the point that on Xmas day we had to open a couple of fanlights because the room was too hot. The inserts also mean that our conservatory is usable when the sun is out - doing exactly as it promises. Further hard evidence on the heat reduction is from an experience we had with our conservatory. We have only had the conservatory since September 2010. Autumn 2010 was quite warm, and we discovered that candle wax had actually melted one afternoon from the heat of the sun. Winter was freezing meaning the room wasn't used. In April 2011 I bought and installed the Polycool - nothing melts anymore, except ice in my drink The room is used all year round - with the under-floor heating only required on the coldest days. Windows are obviously opened in the warm weather, but the conservatory is usually at about ambient rather that sweltering. Plants thrive, particularly orchids and rubber plants. I cannot recommend your product enough - and have done to a number of friends and family. Can we both say a big thankyou for the exellent work your chap did on our conservatory. We have already in this very sunny weather taken to sitting in the conservatoy and not having to vacate it to sit elseware. The advertisment about your product dosnt even come close to saying how good it really is. Where we are in west sussex our conservatory is facing south so we have the sun for most of the day,so it used to get very hot,not any more its lovely. Your staff are wonderful and very helpful in everything they do and are very polite ,which is rare nowdays. So thank you and everyone at Polycool. Dear Andy/Kerry, Just a line to let you know that I have successfully installed your product in my conservatory. The difference is amazing, and my wife and I look forward to far greater use of our conservatory this summer with the reduction in glare and temperature. I must admit to feeling a bit smug and self satisfied with the installation. The reason is that I have suffered from Parkinsons disease for the past 9 years or so. Therefore if I can do it almost anybody should be able to. Thanks for a great product, and if you wish to use this letter or parts of it, please feel free to do so. Yours faithfully. Sir, I am just writing to compliment you on your marvellous product. I fitted the solar inserts with no trouble whatsoever, and was amazed at the difference in its ability to cut down on the heat. My compliments to such a wonderful product. What you said is what I got, a breath of fresh air in this day of mumbo jumbo. It is so good I will be placing another order for my place in Spain. When I first started to look at ways of keeping the Sun out of our conservatory, I looked at blinds against inserts. For the reasons you say in your brochure I decided on inserts. The real bonus was your price, apart from me choosing you on the above the price was extremely competitive. I'm glad I chose Polycool, the roof is now complete and all that you say in your brochure has materialised. To Polycool, we feel compelled to drop you a line having recently installed your gold product in the roof of our conservatory. The results are absolutely remarkable; everything you claim about your product is 100% true. We would have no hesitation in recommending your product to anyone. We get quite a fair bit of sun down here in Poole and Polycool has allowed us to use the conservatory throughout the Summer as never before. We remain your satisfied customers. Dear Sir, We feel we must write and thank you for your fast and efficient service and we look forward to seeing it fitted, we will certainly be recommending you to all our neighbours and friends. To order on a Monday and get it on Friday of the same week is what we call excellent service. Many thanks again. We are a vertical blind manufacturer in North Wales and have recommended your system to our customers for the past two years. We do not sell roof blinds, as I feel they are a much too expensive option and do not work as well as your system. We are wondering, if we could become agents, to supply and fit your system in the North Wales area. 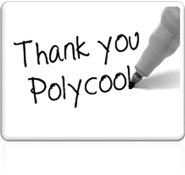 Dear Sirs, I am writing to say how very pleased we are with the Polycool Inserts. My husband fitted them. It has really enhanced the roof. We have had a number of sunny days up to now. The product does work. We shall benefit when the sun gets hotter within the next few months. Thank you for your prompt attention – delivery and answering queries. Yours faithfully. I am writing to say what a good product Polycool is it’s made a big difference in my conservatory since I installed it completely at the beginning of the month and as you know it’s been well tested in this extremely Hot weather we are having at the moment its cool and glare free. I purchased the kit some 18 months/two years ago and have been dubious about how long it would take to install and also the method I did think it would take for ever pushing those strips up so many channels but! I was amazed at how easy it actually was. I would recommend this product to anyone with a conservatory it would save buying blinds. Mine are redundant now! Please use this letter for other interested customers to read. The staff at Polycool are also very helpful if you need encouragement to get going or you see a problem they will help out in every way for it’s good stuff. Easy to install all round. We have found the Polycool product to have had a most beneficial effect on a conservatory at a considerable reduction of the cost we were quoted for blinds. We are very happy with the results which mean that furniture can be placed inside with little risk of damage from the sun as was the case before. That goes for us too! Also, we must emphasise our best thanks to the excellent customer service at Polycool, which was most helpful at all times. Take care, regards. Just a quick message to say how impressed both my wife and I were with the prompt and efficient way that our enquiry and subsequent order were dealt with. When we received our polycool we set to work on our conservatory. After about 3 hours our small roof was complete. It was as easy as you said. Most importantly your product performs perfectly. We can actually sit in comfort in our conservatory without the need for large fans to cool the air. Many thanks from a very satisfied customer. Hi Polycool, We installed your product into our conservatory roof in late spring and after the summer we have just had it has lived up to all you claimed it would. So thank you for a brilliant product and all your help, regards. I have just fitted polycool solar control strips to my conservatory roof and what a difference they have made. The solar strips have done exactly as your advertisement said they would i.e. reduce both temperature and glare. Together with the above they have saved me a considerable amount of money as I had quotes for roof blinds between £2000 - £4000 and I fitted polycool for less than £400. I would have no hesitation in recommending both your product and your company to anyone who is looking to make their conservatory a better place to live in. From a very satisfied customer.